Henry Winstone and his best friend, Frederick Ashton Thorpe, are artists during the Pre-Raphaelite movement of the Victorian era. Although Henry has pretty much forsaken the snobbish materialism of polite society, Fred isn’t quite so ready to give up his fastidious lifestyle. But even Henry must eat and has taken a commission to paint Eleanor Farnham’s portrait. Seeing the half finished portrait of Ellie at Henry’s studio, Fred is smitten and returns the next day to meet her. Deciding she’s everything he’s ever dreamed of in a woman, Fred pursues her and he and Ellie wed. But Fred can’t let go of disgraceful events from his past and this leads him down a dark path of more shameful acts. Ellie too hides a painful past that affects her relationship with Fred. Their marriage deteriorates even more when Fred allows his mother to fire his jealousy with her vicious gossip of impropriety between Ellie and her godfather, Lord Percy Dillinger. When more appalling secrets come to light, not only is Ellie’s marriage in jeopardy, but her mental and physical health as well. 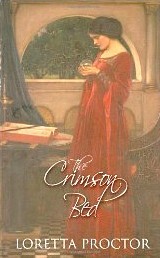 When I first began reading The Crimson Bed, I was hooked within the first few pages. Ms. Proctor is a highly gifted writer and knows exactly how to draw the reader in. At first I didn’t like any of the characters with the exception of Henry. But I couldn’t stop reading and I came to realize these characters were genuine, complicated and deeply flawed, which leant them a certain charm that was mesmerizing. With such extraordinary characterizations, a gripping plot and well-researched historical backdrop, The Crimson Bed is an excellent work of fiction. This isn’t a gene romance, but there is a love story. The historical details of the Pre-Raphaelite movement and the artists are exceptional. This is a character driven novel with elements of romance, suspense and mystery. I was so emotionally invested in the lives of these characters, I laughed, I sobbed, and I bit my nails to the quick during the tenser moments. I dare anyone to read The Crimson Bed and not be so affected. When her husband, successful Orthodontist Burkett Cowley, dies suddenly in his office one bright summer morning, True Cowley is stunned. But becoming an unexpected widow is only the beginning of unpleasant surprises. When it comes to light that Burkett’s gambling debts have left her near penniless, True takes advantage of a free burial plot in their mutual birth place of Belle Hill, Alabama. True left Belle Hill as a child of four, after her mother’s accidental drowning death, and has not been back since. But when she returns for her husband’s funeral, True finds herself inexplicably drawn to the town and the family secrets it harbors. Shortly after the funeral, True sells her Florida home and returns to Belle Hill for good. She is soon befriended by eccentric octogenarian, Maisy Downey, and Maisy’s handsome- beyond-belief nephew, Jackson Bean. The pair promises to aide True in her quest to understand the mother she never knew. But in her search for her roots, True uncovers more questions that must be answered and issues she must come to terms with if she is to resolve the past and move ahead into the bright, happy future that is offered. I enjoyed this story tremendously. True Cowley is a flawed but loveable character who I could sympathize with and cheer for with each turn of the page. I loved the interaction between her and Jackson and the way the romance developed slowly and sweetly. I also enjoyed the touching relationship True shared with her grandchildren. Having also enjoyed the author’s debut novel, Lily in Bloom, I was excited to return to southern Alabama and reconnect with some of the characters from that first book. The author’s skillful descriptions, both of people and setting, seemed to transport me into this charming village filled with unusual people and beautiful flora. Margaret Cunningham writes with humor and grace, weaving a tale that is filled with romance and surprises. One True Place offers its readers so many things — romance, mystery, and a lovely story of a woman’s quest to reconcile herself with her past. I recommend this story to anyone who enjoys a light, humorous, Southern love story. Forever in Her Dreams by Tika Newman picks right up where The Eyes of Innocence left off. Book one in the series ended with readers wondering where Toniya came from. Who would give a stranger a horse? How did the horse from Lina’s dreams appear in her yard? Readers quickly get reacquainted with the characters they enjoyed in the first book and soon get some answers. As the story continues, readers journey along with Kalina as she makes a place for her new horse in her life. She doesn’t know it at first, but the horse will lead her down a path to her past. She will gain information about her heritage and her unique abilities. Readers pick up on her special way with animals as they read of her gentle nature and various healings. She is not limited to helping animals. When needed she also uses her healing powers to help people. Although Lina’s power is not typical and the events surrounding the healings are out of the ordinary, the author’s vivid descriptions and interesting presentations make them believable. Many authors focus on the negative stereotypes when presenting a minor culture. Whether true or fictional this author presents traditions and healing power in a way that doesn’t degrade the Gypsy culture. While the characters are described as very poor and old fashioned, it is refreshing to see this people group portrayed as peaceful, helpful and out to do good. Kalina is a special girl trying to live a typical teenage life. She longs to fill her life with animals, friends, school and family activities. At times the pull to help is too strong to resist. She and her family know what it’s like to uproot and move just when they are settling into a new community. They are often forced to relocate when the secret is in danger of being revealed. Lina tries to think and act like other teens, but her love for animals leads her to make some interesting decisions. She tries to be cautious when it comes to strangers but her strong desire to help others leads her to risk it all in times of greatest need. Cory, the older and charming neighbor boy, Marnie, her best friend, Aunt Jessie, Uncle Jeff, a host of pets and many schoolmates return in book two. New characters also appear in this sequel. The most interesting are Kalina’s grandparents, Stela and Todor,. As Lina learns who they are and how they have helped her at various times in her life, she also learns more truth about Aunt Jessie and how she came to be with her adoptive family. She learns how Toniya came to her. The more she learns of her past, the more she wonders how it will fit with her present. Will Aunt Jessie and Uncle Jeff accept her heritage? Will they believe her grandparents are who they say they are? Will they stick by Kalina even when she goes against their advice? Will her best friend Marnie think she is crazy if she reveals her heritage? Will her neighbor Cory get scared away as he starts to piece together what she can do with her powers? So many questions and once again they will not all be answered by the time readers turn the last page of book two. Pearl believes the author is developing as a writer as she works on this series. This book is just as innocent and wholesome as book one, but it contains deeper insight into the characters, clearer scene descriptions and more realistic dialogue. This novel is a great follow-up to The Eyes of Innocence. The day-to-day life of an animal loving teenager is woven among the threads of mystery and magic that surround the main character. Kalina will continue to intrigue readers with her secret powers. This book is unusual in nature, but easy to follow. It answers many of the questions left when The Eyes of Innocence ended. Reader’s still don’t know the whole story though. The saga will continue when the third book Window to Her Soul is released later this year. Christmas time in Seattle, Washington; a time of glittering snow, twinkling lights — and murder. It starts with a mysterious phone call, the whispered words, “First, we dance.” From there, it leads to a sexual encounter with the beautiful “lady in black.” It ends with murder. As the bodies begin to pile up, homicide detective Jake Samuels finds himself in a race against time to uncover the murderer’s identity in a killing spree that has become all too personal. With no solid leads and no apparent motive, in order to solve this deadly case, Samuels might have to be the next to dance with the lady in black. Some books are so engrossing you have to read them from start to finish, even if it means staying up all night. Craig Lynn Clyde’s LADY IN BLACK is definitely one of these books! This fast paced psychological thriller, set forth in short, delicious bursts, grabbed my attention from page one as I immediately began trying to piece together the clues to figure out the identity of the mysterious lady in black. The author’s writing style is almost hypnotizing and I found myself lured deeper and deeper into the intricacies of the story line with every turn of the page. The background info of the main character, Jake Samuels, is skillfully woven in, and the more I got to know and understand him, the more I liked him. Two parts smarts and one part good, old-fashioned luck propel him through the numerous tight spots he finds himself in throughout his investigation. The story was extremely well crafted and I admired the author’s skill in putting all of the pieces together from its opening scenes to its final, shocking conclusion. The author’s bio states that he is a screenwriter and I could easily see this story unfolding across the big screen. I really hope it happens, one day! The only problem I had with this book was its numerous punctuation errors. I thought they stopped the flow of a plot that would otherwise move at breakneck speed. 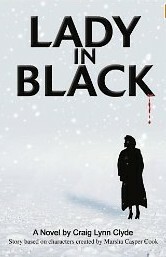 Even so, I recommend LADY IN BLACK to anyone who enjoys a tantalizing murder mystery that keeps them guessing till the very end. 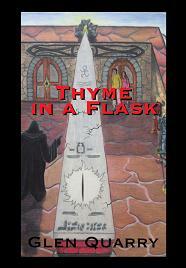 Riddles, puzzles, fairy tales and mysteries; that’s what Thyme in a Flask is filled with. This delightful medieval tale follows seventeen year old Jon Chandler on a quest to find and destroy a magical flask. At the urging of his loved ones and for the good of the entire village, Jon, an apprentice sword maker leaves everything he knows of home and safety as he reluctantly accepts this responsibility and sets out on his journey. Along the way Jon will learn of power: power in the world, power in objects and power within himself. In a parallel story line Princess Joanna discovers her father; King of the magical land of Elisinor has the power to travel in and out of time. The story is whimsical and entertaining even if it causes confusion here and there. Readers may scratch their head a little and feel the need to turn the pages back for a little rereading. Those who stick it out will eventually see how all the story lines and magical creatures fit together. They will discover the stopping of time, mystical places, enchanted characters, the magic of the flask and how two worlds intertwine. The main character, Jon doesn’t set out alone on his quest. Readers also get to know his friends and travel companions, beautiful but flighty Dorthea and Samuel the gentle giant. Samuel is a tender hearted eight foot 480 pound giant friend. Although a little dim, he is reliable and endearing. Dorthea was raised as Jon’s sister, but early in the story it is revealed that this isn’t a birth relationship. The two have their squabbles and differences which often lead to conflict. However, they are united by a common goal and a strong will to fight for the good. Dorthea exasperates Jon as she challenges many of his decisions. It seems to be a love – hate relationship, but readers soon realize that Jon and Dorthea are on the brink of something much more complex than a sibling relationship. Readers will be spell bound as they travel with Jon and Dorthea into a parallel world, where few have ever gone. The author paints a vivid picture of this new world. Readers will be transported in time as they journey with Jon in his attempts to locate the flask that has been missing for sixteen years. They will travel along as Jon tries to outsmart the demons and wizards who set up roadblocks to test his strength and skill. At times it will be hard to tell who is friend and who is foe. Puzzlers will enjoy the clues and riddles sprinkled along the way. Jon and Dorthea will be forced to solve riddles in their attempt to return to their time, their lives and find their true home. In the quest to find the flask the two learn many things about themselves, about life and love. Some lessons prove to be more powerful than magic. Will they come up with the right answers? Will they solve the riddles in time? Glen Quarry’s fairy tale is chock full of twists and turns, plots and subplots, vivid characters and enchanted settings. Readers may sense hints of similarities with other popular fantasy books yet it is so unique, it really is unlike any other. The author introduces new characters with unique powers and a world of his own making. This is no copycat. It’s a brand new story in a new and very original world. Readers won’t want to put the book down but may want to go back and reread certain sections for clarity. Pearl feels it is one of those books that could be read more than once. There is almost too much to digest in one reading. It seems to be one of those books in which repeat readers are apt to discover new details on a second read through. This book would make a great family read aloud. It would be an enjoyable book to read, pause and discuss. It’s a winner for fantasy fans of all ages. Stay tuned, there are more adventures ahead. Glen Quarry is currently working on the sequel to his debut novel. Sedona O’Hala is an ordinary gal making a living working for a successful but ordinary computer company called Strandfrost. She works in a testing lab, reviewing software, testing computer programs and leading a non-glamorous life. After outwitting three thugs that tried to attack her and a coworker she gets the attention of the corporate board and thus blunders into an undercover assignment. In one jump she goes from a lab worker struggling paycheck to paycheck to a ladder climbing company executive. With this new assignment she is given the chance to live every girl’s dream. She is set up in a luxury apartment with a new wardrobe and a fancy car. She can have what she wants and it’s all paid for. Does it sound too good to be true??? Nothing comes without a price – right? The new lifestyle won’t last forever and while living it she has to try and figure out who is dipping into company funds. She is hired to find out who is stealing from the company and she must find out before the criminals realize anyone is onto them or that their secret computer program is being debugged. Sedona vows to play her part convincingly as she tries to get information on missing computer equipment and hacked programs. She isn’t always sure if she is dealing with company insiders embezzling money or serious criminals after something more. If she fails, she could lose her job or maybe even her life. While solving one puzzle, others crop up. For a time there seems to be danger and betrayal all around. In the end there is more than one crime to solve and Sedona finds herself in a few dangerous situations. Along with the danger comes a hint of romance, strengthened friendships, family secrets and personal growth. The author shares ups and downs, frustrations and humor as she describes the escapades of Sedona’s double life. To be honest, I wasn’t sure I was going to enjoy this book by self-published author Maria E. Schneider. I work from home and I’ve never been in the corporate world. Mysteries aren’t my favorite genre and I’ve never been much into sleuth capers. So, why did I even decide to read this book? I took a peek at Maria’s blog and online postings at bearmountainbooks.com. After a little reading there I felt like I knew her and wanted to give her book a chance. She is down to earth and realistic. She isn’t expecting her works to be on Oprah’s next book list but rather is writing for the enjoyment it brings to her. She wants to share stories to bring enjoyment to others. I felt that was worth giving her book a read. It took me a few chapters to settle in and enjoy the characters. The opening scene put me in the middle of drama and action before I knew who the characters were. However, as the book went along and I got to know the characters I enjoyed the mystery solving and appreciated the opening scene more. There are several characters readers will like and some they will despise. While a few scenes were a bit of a stretch for me and a few dragged along, overall the author presented a believable corporate setting with realistic office banter and a touch of corruption that can seep into any company. Sedona is witty, smart, and seemingly fearless in the face of danger. The author did a nice job tying up the loose ends in Executive Lunch while leaving open many possibilities for new story lines with this leading lady should she choose to write a sequel. This is an inexpensive, lighthearted, action filled story that I recommend if you like mystery, humor, and believable characters. As you read you will be given bits of information along the mystery-solving trail. You may think you know whodunit or what is coming next but then again, you may just be surprised. I’ve been hearing a lot of good things about the Women’s Murder Club series by James Patterson and company, so when I came across 2ND CHANCE, the second book in the series, at a used book sale, it seemed the perfect opportunity to see for myself what the Women’s Murder Club was all about. The story opens with a horrific tragedy – a shooting spree at a church in a low-income San Francisco neighborhood which claims the life of an eleven-year-old black girl. As homicide detective Lindsay Boxer sorts through the wreckage of what appears to be a racially-motivated hate crime, a second shooting occurs, tearing the city wide open. With the political powers that be putting pressure on the police department, Lindsay decides she is going to need a little help from her friends; Claire Washburn, the city’s medical examiner, newspaper reporter Cindy Thomas, and Jill Bernhardt, Assistant District Attorney. As these four brilliant minds begin to piece together the clues, it becomes clear that the crimes are not just a racially-motivated killing spree, but part of the chillingly calculated agenda of a madman. I have to say that so far every good thing I have heard about the Women’s Murder Club series is true. The premise is delightful – a city’s best and brightest women working together to get the job done. But far from being Superwomen, Patterson shows his readers just enough of the girls’ private lives and struggles to make them endearing and most of all, utterly human. The chapters are short and sharp, with most under five pages in length, making for quick and easy reading and adding greatly to the aura of suspense. 2ND CHANCE is a nail-biter if ever there was one! I look forward to experiencing the rest of this wonderful series.